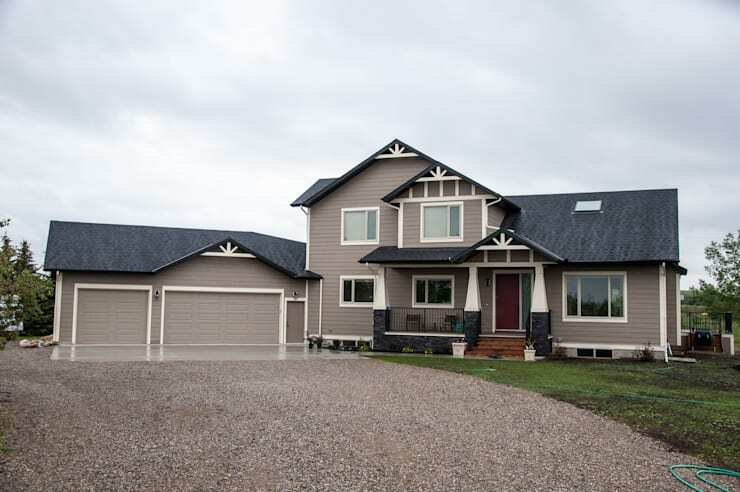 North of Calgary on a small 5 acre (2 hectare) plot of land sits this comfortable family home that’s taking us back to the basics. We’ll look closely at how the design makes the home functional for a family. The home has a touch of country and craftsman design elements. The professionals at Drafting Your Design helped create interiors perfect for a busy family who loves to entertain. Are you ready to discover how to build the quintessential family home? Let’s start our tour. The home has a light influence of country style. At the entrance of the home, we can see that rock has been used to build up the front terrace. The siding is a pleasant shade of greige and the decorative white trim highlights the country design. A three car garage sits next to the house. We love the charcoal grey roof tiles. They bring a touch of sophistication to the home! The main entrance is a warm and homey welcome. The slope of the roof creates a sense of intimacy in this foyer. 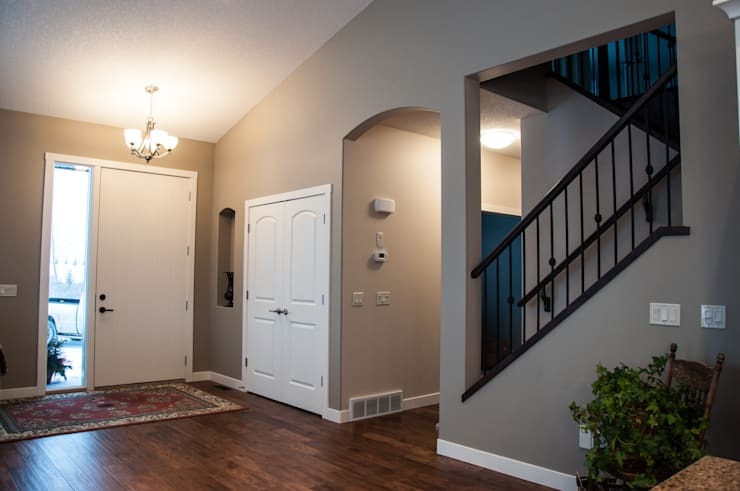 It’s easy to access the stairs or the garage from the entryway. It also opens right into the open plan main floor. Rich hardwood floors and a classic iron railing on the stairs create a refined folk style. The vaulted ceiling creates a sense of openness inside the petite house. Twin skylights illuminate the open plan space. Ample windows on three sides of the home offer views in all directions. Earthen tones make the living room feel cozy. The art and craft style of the wooden furniture brings more country style into the home. The dining layout gives a family all it needs to enjoy meals. 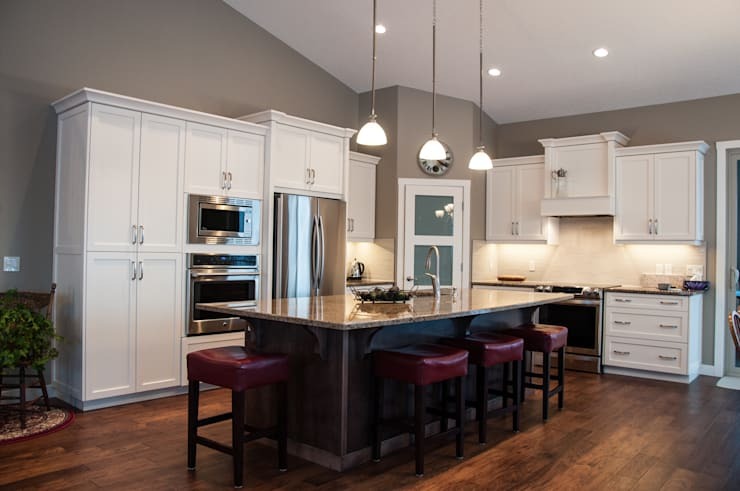 The large kitchen is undoubtedly the star feature of the home. Check out the oversized island in the centre. It’s a great place to entertain and gives you lots of extra counter space. Bright white cabinets make the kitchen seem modern next to the gleaming stainless steel appliances. Ruby red stools around the island create an informal dining space. It's perfect for a quick breakfast before running out the door. No one will be stepping on each other in the morning breakfast rush in this great family kitchen space. 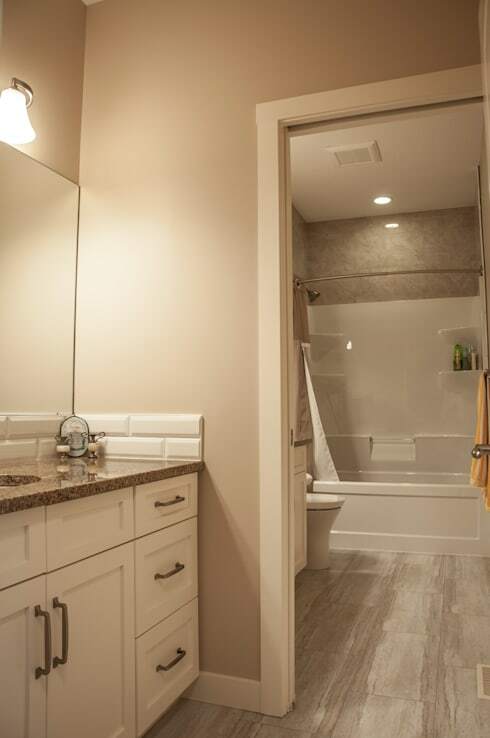 This bathroom is ideal for a family! A doorway separates the two halves of the bathroom. One person can take a shower in privacy while another person uses the sink to brush their teeth. This is an easy solution for hectic mornings when everyone in the family is trying to get ready. Beautiful stone tiles bring unexpected charm to the bathroom. The lack of clutter goes a long way to making the bathroom look spectacular. 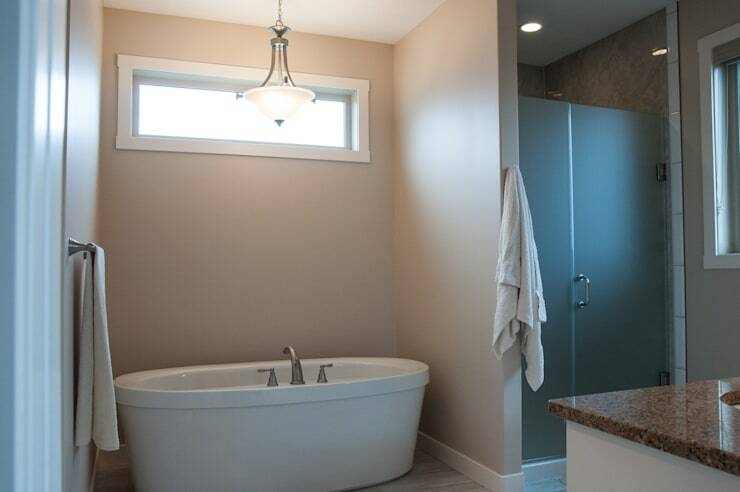 The master suite’s bathroom has a freestanding bathtub and separate shower. 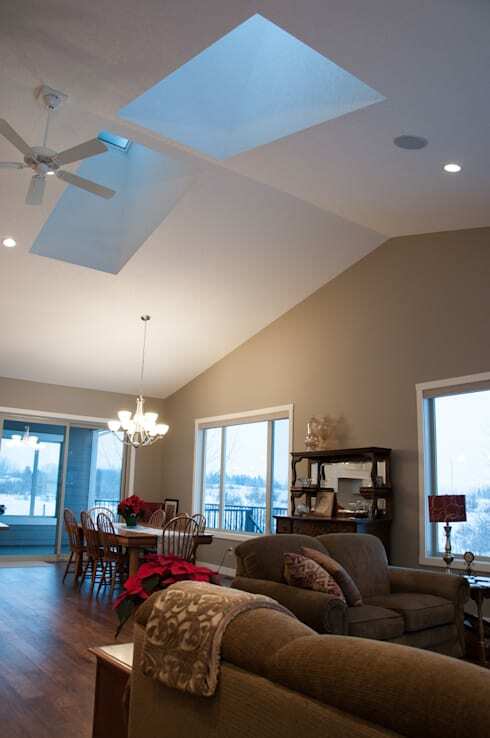 A clerestory window up high is a way to maintain your privacy while bringing light inside. This ensuite is bright and peaceful. Looks like that tub is the best spot in the house to get some alone time! 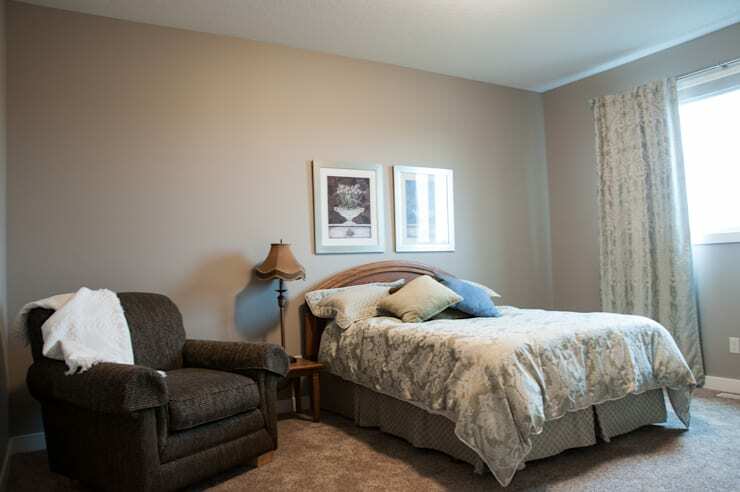 The master bedroom is on the main floor of the home. 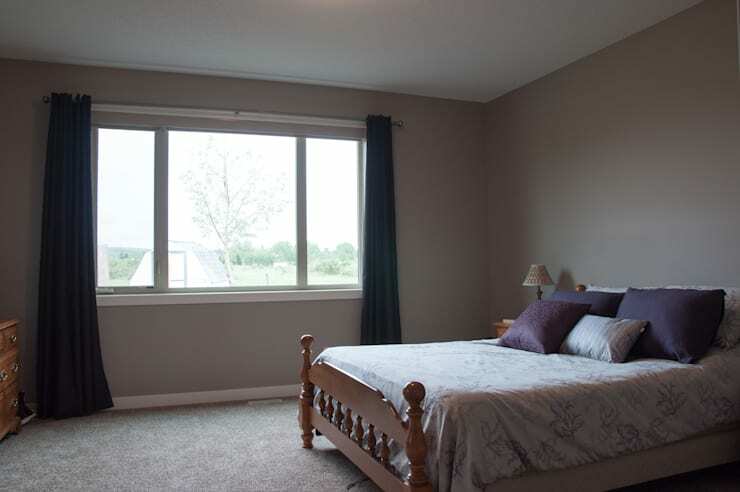 With east facing windows, there is an idyllic view of the country hillside. Simple furnishings and a wash of natural light means that this bedroom is a quiet retreat for relaxing and recharging. Bespoke wooden furniture keeps the country theme alive while the creamy walls bring classic elegance. This second-floor bedroom is bright and homey. Refined country style makes it a cozy bedroom for guests. A high bed like this is perfect for sneaking some storage underneath. With a big family comes big storage needs so it’s great to find storage solutions wherever you can. We hope you enjoyed our tour of the Albertan family home that’s taking us back to basics! Not all houses are well equipped for the trials and tribulations of family life. Shared bathrooms and a frenzied morning squeeze in the kitchen are easily overcome in this house! Want more family home inspiration? Check out our feature on an upcycled family home that delights and inspires. How do you make your family home work for you?